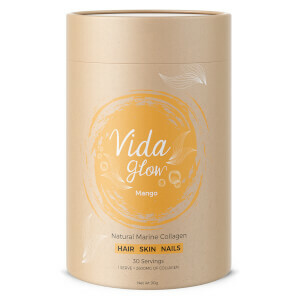 Discover the collection of natural supplements from Vida Glow to nourish your hair, skin and nails from within and enhance your natural beauty. Vida Glow’s marine collagen comes in powder form to make it extremely easy to add to smoothies, soups and stews. The marine collagen is made from pure hydrolyzed collagen protein which helps to replenish the body’s level of collagen to maintain healthy skin, nails, hair and joints. Collagen is the most abundant protein in the human body. Humans naturally produce collagen within the body until their mid-twenties, when the collagen production begins to diminish, eventually ceasing to produce any at all. The less collagen we have in the body, the more we start to notice the visible signs of aging, such as wrinkles, fine lines and thinning hair. To ensure the collagen levels within the body are maintained, it’s essential to replenish your body’s collagen in order to reap the anti-aging benefits and maintain gorgeous, healthy hair. Vida Glow’s marine collagen is sustainably extracted from the scales of Deep Sea Red Snapper from the Pacific Ocean waters of Australasia. The collagen powder has an absorption rate of over 90%, allowing the body to quickly break down and utilize the nutrients. After you ingest the marine collagen, it quickly passes through the lining of the stomach, is absorbed into the bloodstream and is distributed by the blood vessels into the dermis to increase the collagen levels within the skin. 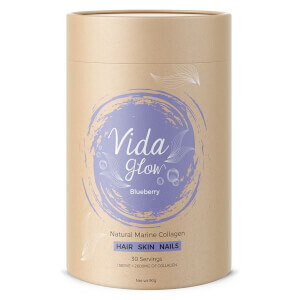 Vida Glow’s Beauty Blend is made of all-natural ingredients, including Manuka Honey, Blueberries, Raw Cacao, Chia Seeds, Flaxseeds, Pumpkin Seeds and Probiotics. The nutritious powder is an excellent addition to the diet; the blend of all-natural superfoods is rich in vitamins and minerals which are essential for healthy, skin, hair and nails. All of the Vida Glow products are 100% natural and contain no artificial flavours, colours, additives or preservatives, as well as being free from wheat, gluten, allergens, soy, lactose, dairy, sugar, carbohydrates and fat.